In the early 1900s, the Pecos Valley Region of Southeastern New Mexico Territory experienced an economic boom because of an influx of settlers into the area. African American families were among those settlers. They built Blackdom, the only all-black town in the territory and situated it about 20 miles south of Roswell in Chaves County. Today little remains of this ambitious frontier scheme that within a 20-year period became an oil producing town. In September 1903, thirteen black men led by Isaac W. Jones and Francis M. (Frank) Boyer, signed the Articles of Incorporation to establish the Blackdom Townsite Company to build the town. Blackdom was located on a direct route to the Dexter train station to the East, and Artesia, another New Mexico Territory boom town 20 miles south. West of Blackdom was Apache land. A few of the early founders were former soldiers in the all-black 24th Infantry which served throughout New Mexico Territory in the 1880s and 1890s. Frank Boyer was the most influential of them having trained as a minister at Atlanta (Georgia) Baptist College (now Morehouse College) following his discharge from the military. Boyer and his wife Ella, also brought black freemasonry to the county establishing the first masonic lodge in 1914. A frontier town relying on dry-farming proved difficult to maintain. Survival depended on rain that often didn’t come. Between 1909 and 1916, however, the rains came and Blackdom was prosperous. In 1917, Blackdom saw many of its young men conscripted into the military as the U.S. entered World War I. When oil was discovered in 1919, Blackdom residents created the Blackdom Oil Company. The single largest investor, however, was Mittie Moore Wilson, an African American brothel owner in nearby Roswell. Blackdom Oil contracted with the New York-based National Exploration Company to drill wells in the area. Current research doesn’t provide exact numbers of working wells but a 1947 interview with Frank Boyer revealed that some Blackdom residents still received royalties from Gulf Oil for producing wells on their property. 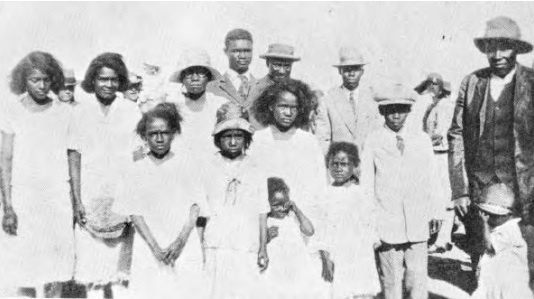 In 1927, the town gathered and celebrated Juneteenth where they hosted their white neighbors with a baseball game and barbecue. Despite the continuing oil revenues for some residents, the 1929 Stock Market Crash and Great Depression effectively ended Blackdom’s future as an independent town. Town leaders dissolved Blackdom in 1930. Maisha Baton, “The Community of Blackdom, N.M,” A Site Survey, Oral History, and Historic Review Project (No. 35-95-10009.09); Elvis E. Fleming, “Pioneer Klan No. 15: The Ku Klux Klan in Roswell, 1924-1934,” Southern New Mexico Review (September 1999); Charles L. Harris, Charles L. Harris' Public Land Guide: A Compilation of Public Land Laws and Departmental Regulations Thereunder (Chicago: Peterson Linotyping Co, 1912); Timothy E. Nelson, The Significance of the Afro-Frontier in American History: Blackdom, Barratry, and Bawdyhouses in the Borderslands 1900-1930 (El Paso: The University of Texas at El Paso Press, 2015). Maisha Baton, “The Community of Blackdom, N.M,” A Site Survey, Oral History, and Historic Review Project (No. 35-95-10009.09); Elvis E. Fleming, “Pioneer Klan No. 15: The Ku Klux Klan in Roswell, 1924-1934,” Southern New Mexico Review (September 1999); Charles L. Harris, Charles L. Harris’ Public Land Guide: A Compilation of Public Land Laws and Departmental Regulations Thereunder (Chicago: Peterson Linotyping Co, 1912); Timothy E. Nelson, The Significance of the Afro-Frontier in American History: Blackdom, Barratry, and Bawdyhouses in the Borderslands 1900-1930 (El Paso: The University of Texas at El Paso Press, 2015).